Heat 1 TBSP oil or butter in a large pot or dutch oven over medium-high heat. Add onion and sauté until tender, approx. 4-5 minutes. Add carrots, celery and garlic and sauté for an additional 3-4 minutes. Add stock, tomatoes, orzo, thyme, oregano, rosemary and stir to combine. Bring soup to a simmer, stirring occasionally to prevent sticking. Reduce heat to medium-low and simmer for 10 minutes, stirring occasionally, until the pasta is al dente and the vegetables are tender. Ready to eat? Stir in the spinach at the last minute and stir into the hot soup to wilt the greens. Give it a taste and season with salt and black pepper as desired. Add your favorite toppings and dive in while it's hot! Vegetarian? Be sure to use vegetable stock and you're good to go! T-Rex? 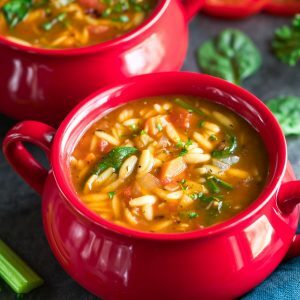 You can absolute add some browned Italian sausage (sliced or crumbled) or shredded rotisserie chicken to this soup!